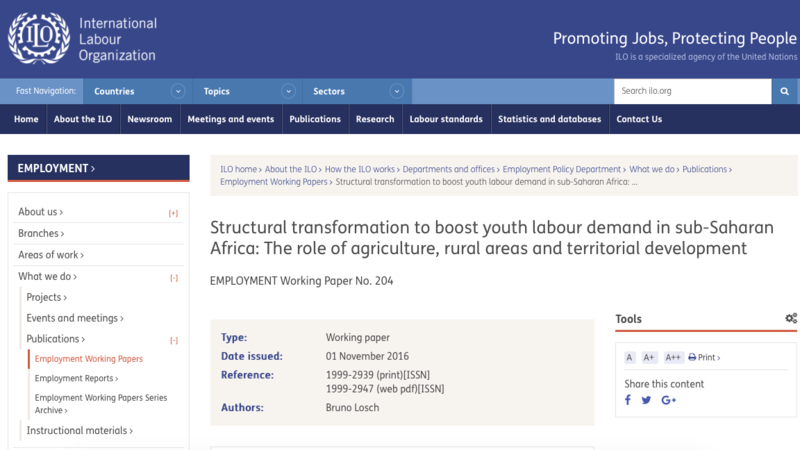 In a recent working paper for the International Labor Organization (ILO) GovInn Co-director Bruno Losch explores structural transformation and the identification of possible building blocks for boosting youth employment in sub-Saharan Africa. The paper begins by detailing past processes of structural transformation and new challenges facing Africa in the twenty-first century. It then turns to addressing the unique structural situation of sub-Saharan Africa, its employment challenges and the enduring importance of the rural labour force. It then reviews the existing policy options for speeding up the regions structural transformation, the limitations of segmented sector-based policies and the importance of reinvesting in multi-sectoral and place-based development strategies. It also considers the rural economy and the need for renewed public policies adapted to the current realities of the region – notably the fading rural–urban divide. This new context requires a better understanding of the underlying processes of change – in particular, the growing pressure on land and natural resources and the consequences for viable agricultural systems, concluding with policy recommendations for an inclusive growth process for youth employment. The paper can be read and downloaded here.